I have to confess I still have not mastered crochet cables. That is why I love the crochet chain cables stitch so much. It gives me a similar look to crochet cables without the complex post stitches. 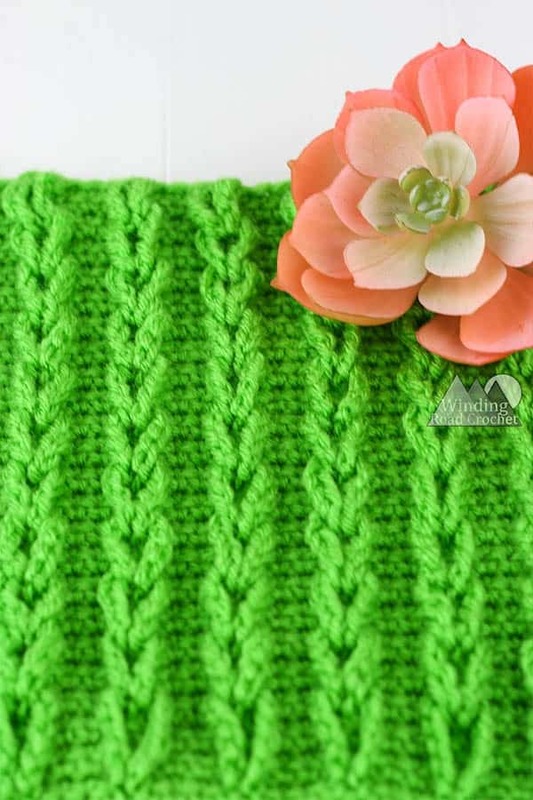 The chain cable stitch pattern uses only chains and single crochet to create a braided or cabled look. You won’t believe how easy it can be unless you see it, so I have provided a video tutorial below in both left and right handed crochet. I was not able to find an official name for this stitch, so I am using the name Chain Cables, the closest name I have found is a pillow pattern using this stitch called the Cable Loop Pillow. The Chain Cables stitch only has texture on one side and can be used on any flat fabric. I use the medium swatch pattern of this stitch found below for a page for my Baby Sensory Book. Do you love to crochet? Check out some of my favorite patterns below! Gauge is determined by using the Chain Cable Stitch. When working Chain Cables you will want to Chain a multiple of 4 plus 1 for your starting chain. Large (Blanket) 12 inch Swatch we will chain 45. Medium (Book) 8 inch Swatch we will chain 33. Small (Block) 4 inch swatch we will chain 17. Ch 17, 33, or 45 depending on the size sample swatch you would like to make. R2: Ch1, turn, Sc in the first 2 sts, Ch12, *Sc in the next 4 sts, Ch 12* repeat from *to* until the second to last st. Sc in the last 2 sts. Note: Make sure you pull all chain loops to the front of your work. R4-5: Ch1, turn, Sc in each stitch across. Repeat Rows 2-5 until your project is as long as you want it. Then continue to the last row. Follow the photo instructions below to braid your loops together before completing the last row. To make this easier I have labeled the loops with numbers. Gray loop is Loop 1, Pink is Loop 2, and Teal is loop three. To braid you loops together you will start with the bottom loop, or loop 1 and pull loop 2 through loop 1. You can see in the first photo that the pink loop (loop 2) has been pulled through loop 1 (grey loop). Then you will move up the braid and pull loop 3 through loop 2 (teal through the pink loop). If you had more loops, the pattern would continue, pull loop 4 through loop 3, loop 5 through loop 4 and so on. Braid together all your loops and then continue to the last row, where you will be single crocheting through the loop to secure the top loop. Last Row: Ch1, turn, Sc in the first two stitches, Sc in the next stitch pulling up your loop through the chain loop, *work a Sc in the next 3 stitches, Sc in the next stitch pulling up your loop through the chain loop,* repeat until the last stitch. Sc in the last stitch. For the 12 inch square work until you have a total of 62 rows. To make a 8 inch square work until you have a total of 38 rows. For the 4 inch square work until you have a total of 18 rows. Written pattern, tutorials, graphs and pdfs for the Chain cables stitch tutorial are copyright Windingroadcrochet.com. Please do not reprint or repost this content as your own, but please feel free to share this link with others. You can find more information on sharing my work with others in the Terms and Conditions Page. I think the instructions for row 2 are off? They don’t seem to match the video. Looks like they’re for the Loop swatch maybe? Thank you for letting me know i have corrected it.